On a recent trip to Italy – yes, I was fortunate enough to travel to Italy – I looked out my hotel room window and saw something strange on the patio below me. 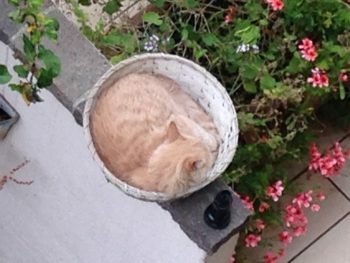 At first I couldn’t figure out what it was, then realized it was a cat curled up in a basket. It looked so safe and warm and comfortable. And it made me wonder: what safe places do we create in our own life? Where do we go or what do we do to help us survive the craziness of everyday life? It could be something as simple as a walk through nature or curling up to take your own nap. And now that I think of it, it doesn’t even have to be a physical place. Maybe it’s a state of mind, like meditation. Or it could be listening to music. Recently I’ve discovered Metta Chanting thanks to my good friend, Debbie, who recently introduced me to it: http://bit.ly/2n6pUEA. I never heard of it before and now I listen to it often – sometimes as I am writing my blogs, and other times in the evening when I am trying to calm my mind so I can fall asleep. So my question to you is: Where do you go to find some peace, if only for a minute or two? Have you found your safe place?